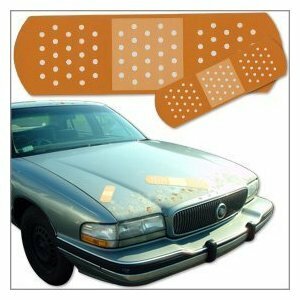 When I was a kid, I had a love affair - with Band-Aids. Even now, I still enjoy the peeling of the wrapper, the careful taking off of the adhesive-covering tabs, the scientifically- researched just-so placement on the finger or other body part, and that feeling of tightness when you can tell that you're protected. OK, I guess I still love the silly little first-aid miracles. But when I was young there was nothing silly about them - they meant the difference between life and death. I was a slow developing child, and by the time I was big enough for a big-boy bike, I was still using training wheels. Somewhere around 8 or 9, I finally got the hang of it, but I still wasn't very steady on my wheels. I remember a particularly scary spill when I realized that the car that was coming wasn't going to stop, so I would have to. I went over the handle bars, and hurt my hands and knees as well as my pride. Riding back to show Mom, I was already looking forward to the number of Band-Aids I would need - maybe it would be a new record. It seemed that even the pain I was feeling was worth it, and truth be told, my injuries were relatively minor. Pickle Adhesive Bandages in Tin Box with Free Toy Inside. When Fashion Band Aids Meant Fabric And Various Sizes...Ooooh! We had the old traditional brown fabric ones at that time, but there were several different sizes. We always used up the smallest and the middle sized ones, of course, so that after a few months all that was left in the metal can with the click-down lid was the really big ones. Once in a blue moon Mom or Dad would have to put one of those on themselves, but this time I needed a big one for each knee, and I couldn't have been happier. Out came the white metal can with the brightly-colored Band-Aid logo and the red cross, and that's when the fun began. Mom let me open each one, since she knew that I loved it, and they were applied one at a time. I would carefully grasp the edge of the top where you had to separate the wrapper, and pull it down, exposing the brown fabric cure. Then I pulled it out of the casing, and peeled off one side of the covering that protected the sticky part. Holding it by the pad itself, I peeled off the other side. Then I carefully centered it over my injury, hoping it would cover it adequately, and apply it. It was important to smooth it down on one side first, give it a little stretch, than smooth down the other side. Repeat this 4 times - one big one for each palm, and one for each knee. I think I beat my previous best that day. 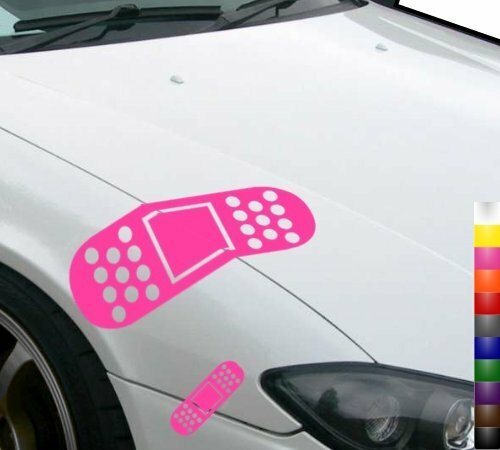 Car Bandages - Cute Bandaids For Your Car! All of the senses were engaged by the process of applying a Band-Aid. The feeling of the scratchy fabric surface was always interesting, and the packaging was as much fun to look at as the container. But there was also a certain fragrance that a Band-Aid had, a bit gluey but medicinal too, that made you feel like you were being taken care of, that you would be OK. And the sound of the peeling back the outside made me smile - it was all fun. Later, when they started making them in colors and with cartoon characters, it was even more of a sensory feast. Then you could have Flintstones stuck to your finger, and that made them even better. 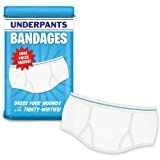 As the variety of sizes, colors, and specific types expanded, I was growing up and it began to seem childish to appreciate the sticky bandages I loved so much when I was young. But I still love them, and if I get a paper cut, I go for a day-glo orange, as big as I can get, just for old times' sake. 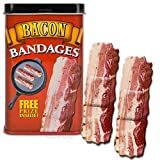 Do You Use Funny Band Aids? Which Ones? 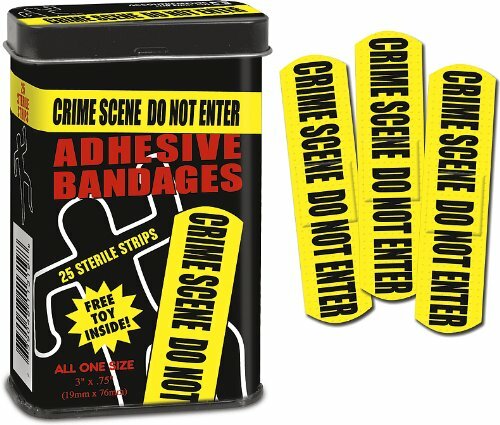 No kidding, these are fun band aids. My youngest daughter loves band aids. She wants to be a nurse or doctor when she grows up. 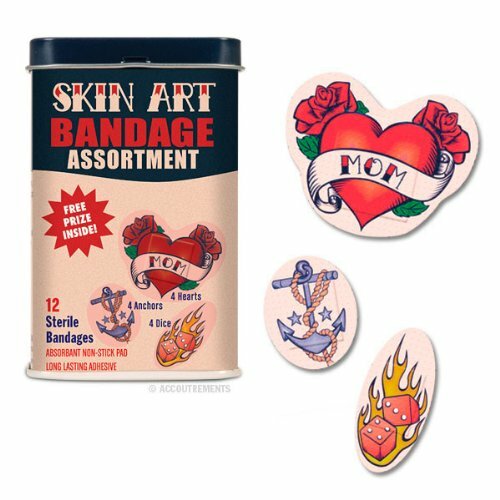 She is going to love these fun band aids. Jim and I thought the underpants were hilarious, too...thanks for your comment! Using gift wrap found in stores can be dull, to say the least. Be unconventional and make a statement by wrapping gifts in unusual wrapping paper next time! 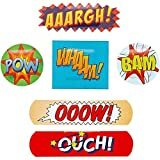 If you are a jokester, you will love giving dollar bill, camouflage, political or many other toilet paper gag gifts to friends - or using them yourself when hosting a party!